Part 1: Introduction to TKN and TokenCard: A platform for the post-bank era. This is the first part in a series of 5 taking a deeper look at the TokenCard platform. Today, the formal introduction to the platform. WHITEPAPER. We’ve been laying the foundation for a depositless Ethereum token debit card and platform called TokenCard. The platform consists of three elements: the Token Contract Wallet, TokenCard and Token App. Nice things. They are coming. The platform’s underlying token, called TKN, has a pro-rata claim on a diversified pool of ETH and ERC20 tokens. The TKN Creation Event starts on 2nd May 2017. The Token Contract Wallet, which secures users’ assets and enforces user-set spending and security parameters. The TokenCard, which connects your Contract Wallet to the network — enabling online payments, PoS transactions and ATM withdrawals, using ERC20 tokens inside the Token Contract Wallet. The Token App, which neatly unifies the process, offering a clean and intuitive experience. And TKN, the TKN token has a pro-rata claim of a diversified pool of assets collected from fees on the TokenCard. TokenCard allows you to spend ERC20 tokens at terminals around the world. This is revolutionary, you could buy a coffee in DGX, ETH, DAI or any other ERC20 token. You can even spend multiple tokens in a single transaction or spend tokens to autonomously maintain a desired portfolio allocation whenever you swipe your card! This is where the Token Contract Wallet comes in. The Token Contract Wallet is an Ethereum Smart Contract wallet that functions as a user’s token bank account, funds are taken from here whenever you swipe your card. This is amazing. You never have to deposit money with us, ever: your funds are secured inside a Contract Wallet that you control — allowances made to enable TokenCard transactions are set by you the user, and can be modified or revoked at any time. 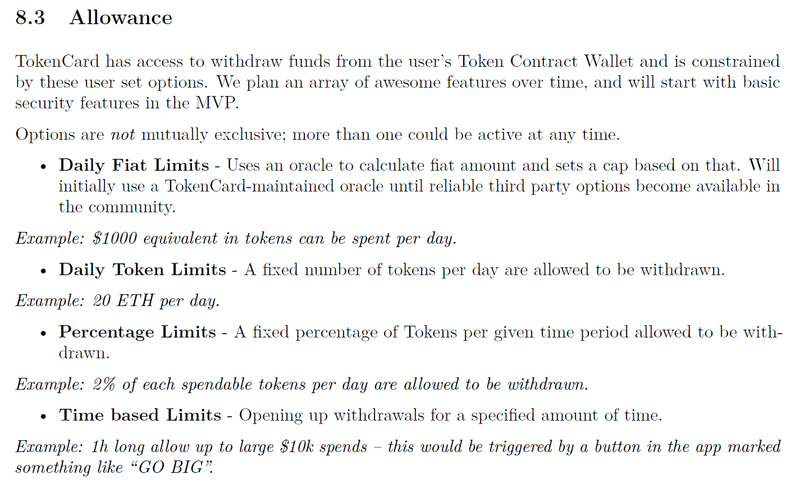 Excerpt from the whitepaper detailing allowances. This is a much better experience for the user. Traditionally, users are forced to make sacrifices in functionality to gain security or in security to gain functionality — forgoing the greatest benefit of cryptocurrency: control of one’s assets! With TokenCard, there is no trade-off. You retain the security and control of a contract wallet whilst gaining the utility of a payments network. First and foremost, the Token App allows users to interact with their Contract Wallet. Users can set-up innovative spending options based on different parameters and curate their security profile to fit their lifestyle. We’re also reimagining the way users manage their token finances. For example, the App provides on-the-fly information about transactions. Whenever a user swipes his card, a transaction entry will simultaneously appear in his Token App — this entry shows transaction details such as: location, establishment type, amount spent (local fiat amount and token), and transaction location using Google map’s API. Users can also re-balance their token portfolio by using our in-app token-token exchange. Users need not withdraw and deposit funds into a centralized exchange to do this, they can simply exchange tokens within their Contract Wallet at the touch of a button. Our goal is to have a product that anyone can use, without having to master the underlying technology. So, as part of our road map, for assets with enough liquidity, we’ll be providing a simple in-app fiat-token exchange. This provides users uninitiated to the token economy with an accessible on-ramp to, not only our platform, but to the token economy at large. TKN is the underlying token of the TokenCard platform. On May 2nd, we will be launching the TKN Creation Event to raise funds to build the TokenCard platform, as described in the TokenCard Whitepaper. Since the TKN Asset Contract accrues licensing fees in the token transacted in, it will eventually equate to a diversified portfolio of the most popular tokens on the Ethereum network. This is a very attractive property: TKN holders effectively have a passive stake in the growing economy of tokens, making TKN perhaps the best asset to hold in the coming Dapp Storm. TKN holders can invoke a mechanism known as ‘Cash and Burn’. Invoking ‘Cash and Burn’ redeems your pro-rata share of tokens within the TKN Asset Contract, however, this also irrevocably destroys the TKN. As holders burn TKN to receive their share of the underlying, they forgo any claim on future accrued licensing fees. This means remaining TKN holders will now have a larger proportional claim on the TKN Asset Contract! In this way, we expect TKN holders to rarely burn — only in the case when the market value of TKN lies below the cumulative value of the underlying assets. The TKN creation period will commence May 2nd 2017. Ether, and other tokens can be contributed in exchange for TKN. The creation will be capped upon receipt of $4.5mm. The Token Creation period will last seven days. If the cap is reached before the end of seven days, additional contributions will be accepted for 24 hours in case users missed a very short window for TKN creation. No more TKN will be created after this period. Contributions can be made in ETH and a numer of other tokens. Tokens that are partnered with TokenCard will receive a 2.5%-5% bonus in TKN. Instructions and supported tokens will appear on our website before the TKN Token Creation. Catching up on TokenCard? Read this. Join our recently created slack channel. To learn more read our whitepaper. To stay up to date subscribe to our newsletter. TokenCard is created by Monolith. We announced last December on reddit. Our partnership with the brillaint Digix Global. Interview with Mel Gelderman TokenCard project leader. Next up: The brilliance that is TKN.